William Francis Jordan was born November 14, 1838 in the state of the Lone Star Texas. At that time Texas was at war with Mexico, and his father John Jordan was a Texas Ranger. He was the third son of John and Eliza Jane Jordan. The war was soon over and won by the Texas army with General Sam Houston in charge. William's Uncle Francis Jordan fought with that army. Some years after the war, William's parents went into the salt manufacturing business at Jordan Saline. In his young years ,William helped his father in the salt business. His father and his father's partner, Alney McGee, made up a wagon train in 1850 and moved to California taking the southern route. They landed in San Diego, California. William was 12 years of age at the time and he made a good hand throughout the trip. The train members elected William's father, John Jordan, Captain of the train and Alney McGee the wagon master. The wagon train consisted of 60 wagons, over 800 head of work stock of oxen. horses and stock cattle. There were around 280 men, women and children. The wagon train broke up in San Diego, each family and single people going their own way. After two months stay in San Diego, Captain John Jordan moved his family up the coast to San Juan Bautista Mission, in the vicinity of Monterey Bay. This is where Captain Jordan settled down and built a hotel and a store, with the help of young William. The women folks did the duties in the hotel and store while Captain John and young Bill ran a herd of cattle on the open range in the rolling hills. When the cattle were ready for market, they drove the cattle across the upper San Joaquin Valley to gold mines up in the Mother Lode Country and sold them to the miners. During this time William was growing older, stronger and gaining experience. In 1856, Captain Jordan made a trip to Tulare County and to the town of Visalia. William accompanied him on this trip at the age of 17 years. On this trip Captain Jordan bought 80 acres of land, ten miles east of Visalia, near the south side of the Kaweah River, where he decided to make his home. In the year of 1857, Captain John Jordan sold his holdings in San Juan Bautista and moved his family to Tulare County. Young Bill helped during this move. On the 80 acres which Captain Jordan bought, they soon built their home and out buildings. During the next three and one half years, William took it upon himself to take a try at mining, so he went into the gold mines up in the Mother Lode Country. He saved a tidy sum of gold and when the mines were playing out he came back home just in time to join his father and brother Silas Tolburt on a prospecting trip. It was in the year of 1860 when William joined his father John Jordan and brother Tolburt and another man on a gold prospecting trip, over in the Panamint Mountains. They took the route over the Sierra Nevada Mountains using the Walker Pass, a well known route. Once in the Panamint Mountains, they made camp in a likely mineral section of the country and spent most of the late spring and summer prospecting. In late August they ran out of food, so Captain Jordan and the other men struck back home for food. While they were gone William and Tolburt continued prospecting for gold, which was not plentiful. One morning before they got out of camp, a small band of Indians came into camp, very hostile. Bill and Tolburt grabbed their rifles and backed into the door of their cabin and held their guns ready to fire. The Indians, very mean, finding those two very young men so brave and no older men around, decided to let them be. So they went on their way. Soon, the Indians were gone and out of sight, and nowhere to be seen. William and Tolburt packed a few things and left for home, never to return. That was the end of that mining expedition. They were in hostile Indian country all the time anyway. In the year of 1860, there was a large strike of silver and gold veins in the mountains east of Owens Valley, which started a miners rush in that direction. The people in the San Joaquin Valley around Visalia wanted to join that rush and were seeking a short cut to that region. The only way to get there was the Walker Pass in the south and Sonora pass in the north across the Sierra Nevada Mountains. Both were a long way around. Captain Jordan looked into and got a franchise from the Board of Supervisors of Tulare County to build a trail across the Sierra Nevada Mountains to the east, which would cut traveling time considerably. Early in 1861, Captain Jordan took his son William in as a partner and they made up a trail building crew of Tolburt Jordan, two other men and two Indian guides. In early May of that year, they started on this trail building expedition. It was to be a toll trail. They were gone all summer. William and Tolburt spoke of seeing golden trout fish in part of the mountains they went through. It was quite a sight to see the golden trout. They built an early trail crossing and a late trail crossing all on the eastern summit. The north crossing was a shorter route but the pass was much higher so the lower crossing was better for early crossing. The lower pass is 9,260 feet and the north pass is 11,000 feet. They completed the trail building that fall. In the early spring around the first of May 1862, Captain Jordan decided to go back over his trail to make a few mends and set up headquarters over at Independence. Captain Jordan, William, Tolburt and one other man set out on the trail. They encountered some snow, but not enough to stop them. They made mends and set up headquarters in Independence, and did some other business. Then they started back home over the trail. It was around May 15th when they got back to big Kern River. Crossing the trail they found the river running over its banks, in a torrent of swift water. The weather had warmed up causing the snow to melt up in the higher regions. Water was running high. Captain Jordan decided to wait out the warm spell until the river was fordable. In the meantime Captain Jordan's wife, Eliza Jane, grew uneasy as her husband had not returned when he said that he would. She sent a party in to find him. The party found him and his party on the east side of the Kern River, at so-called Kern Flats. They were almost starved as their food had run out. The river was still running high and dangerous. Fording was impossible. The west party could not get to them to give them food. They finally positioned themselves up the river on a low bluff an the west side and cooked the food and threw it across the narrow part of the river in a sling. In a day or so, the east party got fed and were stronger. The river was still too high to ford. John Jordan said that he had to get back to Visalia to report to the County Board of Supervisors that his toll trail would be ready for business on the 4th of June. He grew anxious to get going, so he and his men decided to build a log raft with one long pole to push the raft with. About three quarters of the way across, the raft and men were going downstream very fast. They hit a large object in the rapids and busted up. Captain John Jordan called to his men to grab the pole and hang on. John Jordan missed the pole and they saw him come up for the third time and that was the last they saw of him to this day. They never could find his body. William was his father's partner in this toll trail adventure and could carry on, but he decided not to. His father's death was quite a shock to him. At home he was consoling and thinking. When making the trail up through the Yokohl Valley, he had grown very enchanted with it. In the summer of 1862, he went up in the Yokohl Valley and squatted on a piece of land in the middle of the valley up above Mr. Brooks' holdings. This was before the valley had been surveyed. The Yokohl Creek ran through it. There were some large springs of water in the area too. Bill built his cabin and home to the south of Yokohl Creek next to the Bald Hills where there was a large spring of water. Mr. Brooks who was running a large band of sheep, and had been for several years, sold Bill a small band of sheep to run on his newly-acquired ranch holdings. This got Bill in the sheep raising business. Mr. Brooks had a large family, mostly of girls. Bill built his sheep business up to a large band over the years and did well. During this time he fell in love with one of the Brooks' girls. 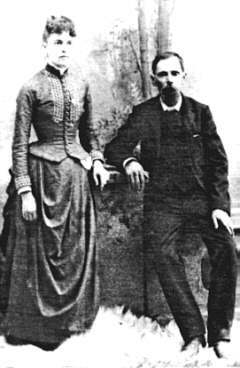 February 10, 1870, he married Henrietta Brooks. He soon moved his young bride into his small cabin after he had fixed it up some. They settled down for a good life. They worked together accumulating more land by buying out homesteaders and railroad land after the land had been surveyed. They accumulated about 4.000 acres of land. On January 6, 1871 their first child was born, Alice Marjorie Jordan. She only lived one day. In the meantime they built a new house close to the Yokohl Creek. It was a larger house for better living. They were prospering. 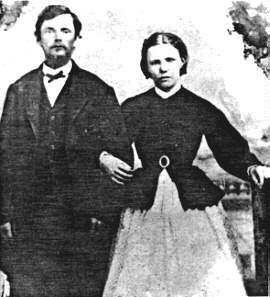 On March 19, 1872 their second child was born, Sarah Elizabeth Jordan. She died on October 14, 1872. This left them in a very depressing mood. By this time Bill Jordan and family had several new neighbors who moved up in the valley, taking up homesteads, and Bill was liked very much by his new neighbors as he helped them in every way that he could. On September 13, 1873 their third child was born, Laura Frances Jordan. She was a healthy child. By this time Bill began to cut his sheep herd and started with a few head of cattle, which he kept building. As time went on, a saw mill started sawing lumber up in the Milo Country east of Yokohl Valley and Bill hauled considerable loads of lumber from that mill for future building. The only supply town was Visalia, 20 miles away. It would take them all day and up into the night every time they went for supplies, which was not very often. They went three of four times a year. On October 19, 1875 their fourth child was born, Andrew Jackson Jordan. He died on May 9, 1878. In those days neighbors helped each other out so Bill was provided with plenty of help. His sheep and cattle were bringing in good revenue and he decided to raise some grain and hogs. On January 9, 1878 their fifth child was born, Henry Sadorus Jordan. He died on April 25, 1878. Diphtheria, scarlet fever and smallpox took the lives of children in those days. In the year of 1878, William Jordan built his third house and home, one and a half miles from his second house. north of Yokohl Creek, and up just below the Sycamore large spring. It was a large three bedroom home with running water from the spring. 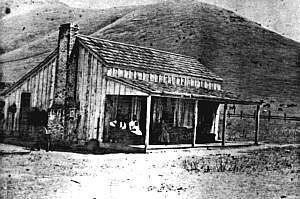 This was the first home up in the Yokohl valley with running water in the house. The pipe was black iron. They made a large garden irrigated from this pipe and spring. Through this pipe, he also irrigated a small melon grove on the flat below the house. The house was up on a large knoll next to a large hill. On May 21, 1879 their sixth child was born, Mary Jane Jordan. She died August 21. 1882. William and Henrietta were very happy in their new home and living well from their ranching and farming business. On August , 1881 their seventh child was born, Alma Louise Jordan. She was a very healthy child and grew to womanhood. William had a great sorrow come into his life. On October 26, 1882 his beloved wife and partner, Henrietta, passed away leaving him to raise their two girls. He had made them all a good happy home. The best he could at that time. He had a burial plot on the ranch where he buried the people that died. The next few years were very lonely and trying for Bill.,but he kept his ranch and animals in good order. William Jordan married a second wife in 1888. Her name was Mary Sydmor Combs. To that union were born four healthy sons. William Shortridge Jordan, Allen Sadorous Jordan, John Cuthbert Jordan, and Samuel Howard Jordan. Mary, or Aunt Molly they all called her, raised his first two daughters, by his first marriage, well. Bill and Molly were doing well when a money panic hit the country in 1893 and he could not sell any livestock of any kind. He couldn't even sell wool or farm products. Nobody had any money to buy anything. Bill had to have money to operate the ranch and to live on, so he mortgaged his ranch. In about three years, the economy got a little better. This loosened him up some. A light panic hit him again in 1898, which finished him off. His mortgage holder started foreclosing and in 1899 his brother James B. Jordan bought up his mortgage and gave him his home and 480 acres for him to live on the balance of his life. In the early 1890's or late 1899, Hugh Hamilton gave 20 acres of land up high and dry, northeast of Exeter about 5 miles, for a burial spot or cemetery for the settlers to bury their dead. In about 1894, William Jordan removed his first wife and children from his burial plot and reburied them in the Hugh Hamilton Cemetery with marble head stones on each one. On September 1, 1901 William Francis Jordan died upon his beloved Yokohl Valley ranch ,where he lived most of his life raising two families in a good manner.